Try our award winning wings smoked daily. Begin with fresh wings, slow cooked over a hardwood fire, tossed with your favorite sauce or order them naked. Sauces include: Sweet, Medium-Hot, Hot, Caribbean, Carolina or Dry Rub. Lightly breaded and served with ranch dipping sauce. Lightly breaded and served with cusabi dipping sauce. Eight (8) hand scooped and loaded with jack and cheddar cheese, bacon morsels and sour cream. A Customer Favorite! Lightly battered and filled with sweet corn. Mixed salad greens with smoked BBQ chicken, bacon, cucumber, tomatoes, hard boiled eggs and shredded cheese with a chipotle ranch dressing. Crisp romaine lettuce, croutons, parmesan cheese with Caesar dressing. Crisp romaine lettuce and spring mix, tomato, cucumber, onion, croutons, and cheese. 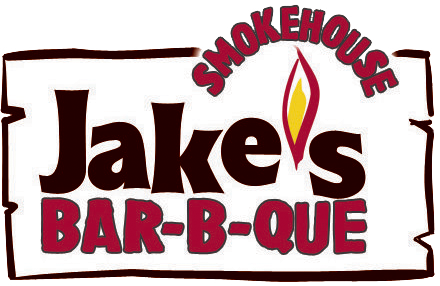 Originally created in Brunswick County, VA, Jake's rendition includes local spices and lots of beef brisket, chicken, pork, tomatoes, potatoes, corn and onions. Welcome to Jake's where you'll find the best ribs around. Smoked daily over a hardwood fire creating that special smokehouse flavor enhanced by our own blend of sauces. All of our ribs are grilled to perfection in the kitchen with Jake's sweet BBQ sauce. If you prefer your ribs with no sauce, order them "naked". Add your own sauce at the table if you prefer. Memphis Style Ribs, meaty and full-flavored (10-12 Ribs). Memphis Style Ribs A smaller portion (5-6 Ribs). Full slab of tender, sweet baby back ribs. (12-14 Ribs). 1/2 slab of tender, sweet baby back ribs. (6-7 Ribs). Served with garlic bread and choice of 2 sides. Combine our savory ribs with your choice of our other delicious slow-cooked BBQ. The ultimate BBQ meal. Treat yourself to a variety of our slow-cooked BBQ and sample the best we have to offer. Substitute Baby back ribs for an additional 1.00. Served with BBQ beans, cole slaw, french fries and garlic bread. 1/2 lb of Hand Pulled Pork or Carolina Style Chopped Pork. If you prefer your ribs with nothing on them, order them "naked." Platters include 1/2 lb of meat and are served with garlic bread and a choice of 2 sides. Smaller portions are available for $2.00 less. Sauces: sweet, medium hot, hot, Caribbean, Carolina or dry rub. Lightly fried served with honey mustard sauce. Marinated in special spices, serviced grilled, blackened or Cajun. Sandwiches include a 6 oz portion of meat on a fresh baked bun, served with a choice of 1 side. Served on a fresh baked bun with lettuce, tomato, onion and a pickle spear. Sliced pieces of tender brisket covered with jack cheese and grilled onions served on garlic bread. 1/2 pound burger with pulled pork, cheddar cheese, onion strings and hot BBQ sauce. Grilled chicken, romaine lettuce, parmesan cheese with Caesar dressing. Smoked brisket smothered in cheddar cheese topped with pulled pork and onion strings. 1/2 lb burger topped with American and jack cheese, bacon and sweet BBQ sauce. For all the Little Jake's 12 and under. Pulled pork, chopped pork or chicken. Lightly fried, served with honey mustard sauce. A blend of melted cheese over elbow noodles. Grilled breast of chicken with garlic bread. Grilled Texas toast with American cheese. Anything with an '*' please add a dollar. Topped with ice cream, fudge and whipped cream. Vanilla wafers, bananas topped with whipped cream.